I am in Scotland but my pup is from Wales. His Mum was rescued from terrible conditions in a puppy farm and weeks later our Baxter appeared. Hi and welcome from me and my two girls I live in West Wales too.I am originally from North Wales. Whereabouts are you? looking forward to hearing about Ellie. I agree with everyone here they are a joy to live with.I have an almost 4 year old and a 2 1/2 year old both girls. Welcome from Holland! 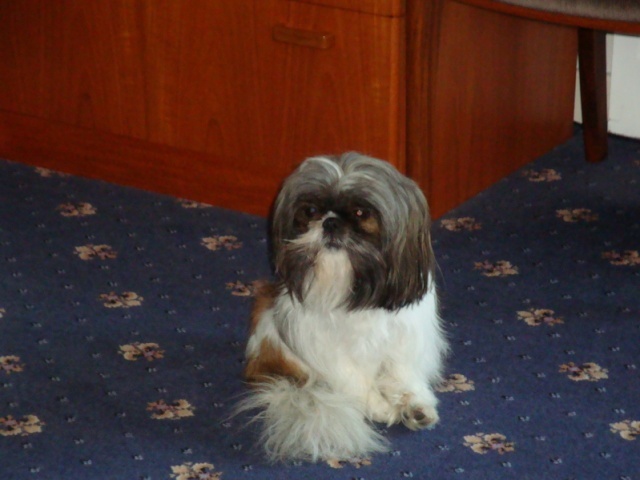 I have a shih tzu boy called Javari and he is the love of my life! Hi I am not far from you then near Cardigan. Last year a few of us met up at the Burns Dog Day out at Pembrey we had a great day with our dogs. Were you there because we saw one or two Shih Tzu's . What colour is Ellie. Mine are Brindle with a bit of white that is Mali, and Tasha is white and grey although on her pedigree she is said to be Gold and white but she has got paler as she's got older. looking forward to seeing pictures of Ellie. I have disabled the Adblocker so can post pictures again. 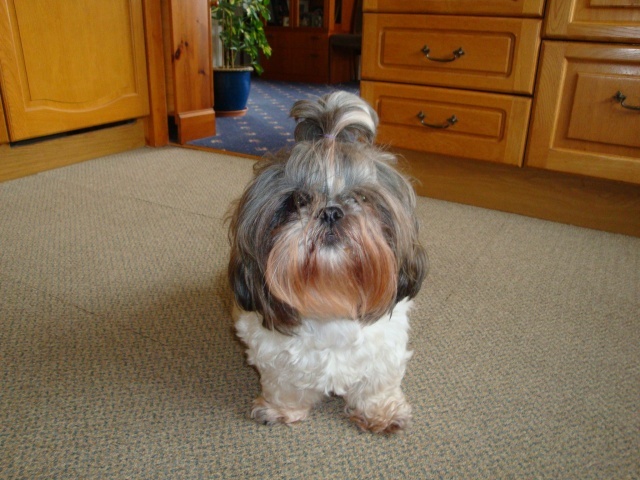 This is Tasha with her top knot which is growing nicely now . It is about 7 months since it was cut last. Oh Carol they are both so cute...I love Tasha's red beard and Mali is so small and cuddly. Beautiful dogs!!!! Awww ! Such Cuties ! tuppence wrote: Oh Carol they are both so cute...I love Tasha's red beard and Mali is so small and cuddly. Beautiful dogs!!!! thank you Carole, Tasha's colouring on her beard is down to the drinking water I think, her beard should be white. I will have to look into the rocks to put into their water I think that is also what they do. Lovely dogs you have, I could look at pics of them all day, Ellie is gold and white with a few bits of black on her face and ears, she has also faded a lot since she was little, no I wasnt at Pembrey last year when you got together, although, I do go there a couple of times a year, its lovely for the dogs, it has everything, sand, grass and woods. Cardigan is really nice, are you near the coast or more inland? A little inland nearer Newcastle Emlyn. Did you get Ellie locally? Hi Elliesmum. I am quite close to you. I am from Swansea. 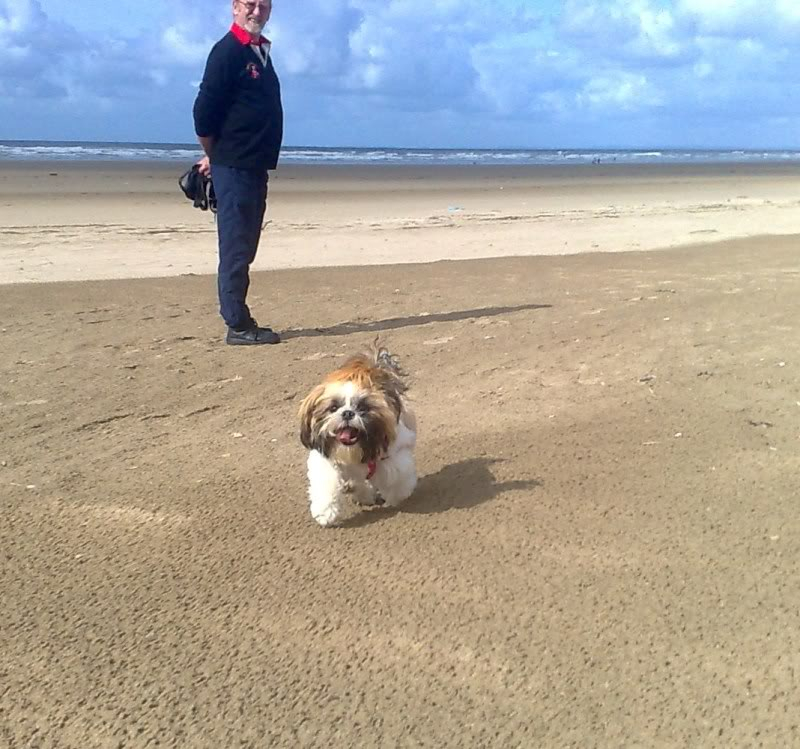 Strictly speaking I don't have a Shih Tzu, Simba belongs to my Mum and Dad, but my Mum is disabled so I do a lot of the looking after, and very often take him out for fun walks to the beach or woods. We would love to see photos of Ellie, I know we are all asking, but we all love to see what other peoples dogs are like! I got Ellie from Whitland, an elderly lady bred her, as far as I know, she has had a Shih tzu for years, always bred one litter to keep a pup from so the 4 she has had started with her first dog, if I remember rightly, her original pup came from Tenby a long time ago. I will also have a proper nosey around the forum when I eventually get on the laptop, there must be lots of great threads to read up on. Ellie is gorgeous. they love it at Pembrey sands . We do take ours there too. She is a big girl. the photo has taken well. You will find lots of advice here we are very friendly bunch. We got Mali not far from Whitland. Tasha came from North Wales and winged almost all the way home,bless. Aww bless, it was quite a way to travel from north wales as well, yes they do love it there, Ellie is quite small I think compared to some we have met, sometimes if its nice and we fancy it we go to Carmarthen car boot on a sunday, I like the gardening stall there, we always take Ellie and quite often there will be a Shih Tzu or two to meet, do you ever go there? Elliesmum wrote: Aww bless, it was quite a way to travel from north wales as well, yes they do love it there, Ellie is quite small I think compared to some we have met, sometimes if its nice and we fancy it we go to Carmarthen car boot on a sunday, I like the gardening stall there, we always take Ellie and quite often there will be a Shih Tzu or two to meet, do you ever go there? funnily enough my hubby wanted to go last Sunday but we decided to go else where. I will let you know when we are going again.Ellie I thought from your photo looks quite a big girl I am sure my two girls would love to meet Ellie although Tasha is a bit of a bully don't worry I have her under control . And Ellie is a wimp, so dont worry if she moves away at first, once she realises things are fine she soon makes friends. Tasha is a bully because of her size against Mali's tiny size . Mali although nearly 4 years is very laid back but they are both amazing friends. Ellie is a real cutie. I can see that the Burns Dogs Day Out in Pembrey is going to be fun this year, there will be a whole gang of Shih Tzus running round. I just hope the weather is good and Lauren isn't going back to uni that weekend or I am doomed again! Ellie sounds like Simba, he runs and hides behind your legs if a dog rushes at him, but if they come slowly he is fine. If he sees a dog in the distance he just sits and waits for it to come to him!